NEW: Join our Facebook Community! If you have been with us for a little while then you’ll know we talk a lot about some of the challenges and implications of managing your cryptocurrencies and holding them securely. But, it’s important to understand that there are alternatives to direct investment, and there exist a growing range of funds and managed products, which provide other opportunities. You don’t have to buy and hold cryptocurrencies yourself, to be exposed to the growth potential. 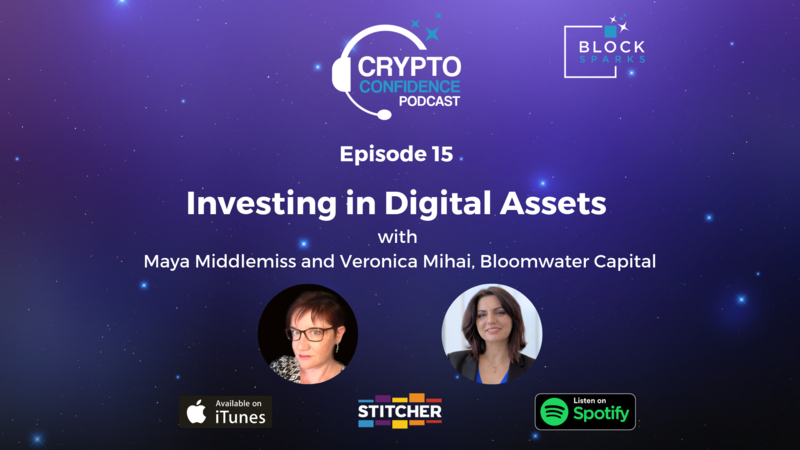 To discuss this we’re very pleased to be joined by Veronica Mihai, who is the Founding Partner & Head of Investor Relations at Bloomwater Capital. Her diverse interests and wiggly career path to this role reflect everything we love about the crypto journey and makes for a great conversation – ranging from women in tech to lifelong learning. And of course we talk about Bloomwater Capital, and what a hedge fund does – who is allowed to invest in them, how they are regulated. And we also discuss other funds and investment vehicles for digital assets, including derivatives and index funds, and the prospects for crypto-based ETFs. Lots of ways to try and master the volatility of this asset class… But we don’t give any financial advice or recommendations, not on this podcast! Let us know what you think, about Veronica’s insights and views. A second layer payment protocol, which sits on top of the cryptocurrency (such as bitcoin) – a direct payment channel which enables faster smaller payments to happen, without each one getting written to the blockchain itself. It has the potential to revolutionise the way bitcoin and other cryptos work, because it addresses many of the scalability issues the network faces. We really want to find an expert to come and explain it to us in an interview soon, but for now here’s an introduction to the Lightning network, and second layer protocols in general. If you like what you hear, we’ll be sharing new episodes every fortnight. So please subscribe via your podcast app of choice. Want to get started buying your first cryptocurrencies? We suggest looking at Local Coin Swap or Coinbase – these links help support the show.